Opto 22 was founded in 1974 by engineers who designed a better solid-state relay and chose to build it in a non-corporate, flat organization. Now, 40 years later, we're still privately held, lean, and run by engineers. Opto 22 products are designed to run on non-proprietary communication standards like Ethernet and the Internet Protocol (IP). Open standards and commercially available technologies decrease the cost of automation and open up data for use where it's needed. Over the years we've had a hand in promoting industry standards. In 1978 we developed the red-black-yellow-white I/O module color-coding scheme, still the standard today. In 1982 we introduced Optomux, which soon became an industry standard protocol. In 1995 we started the OPC task force (later the OPC Foundation) with four other founding members, to develop standards for interoperability among vendors' products. In 1998 we introduced the first commercial Ethernet-based I/O unit. 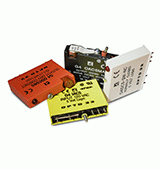 Opto 22 I/O, controllers, and SSRs are famous for their quality and reliability. Customers often comment about their dusty, 20-year-old "Optos" still doing the job in the back of a factory somewhere. With this kind of reliability, we can afford to guarantee SSRs and most I/O modules for life. Since all our products are manufactured and individually tested at our headquarters in Temecula, California, we control quality from the ground up. So we also give you FREE pre-sales engineering help, free hands-on training, and free product support from experienced engineers. Because we're engineers, we know what it's like to lose an idea because it's too hard to implement. Designing and integrating automation systems can be frustrating. We simplify your job with open standards, easy-to-use software, clear documents, and how-to videos. Have a question about configuring your system or which I/O module you need? Pre-sales engineering help is free. New to Opto 22? Instructor-led, hands-on training is available. Product not doing what you expect? Product support is free. For industrial automation, energy management, discrete manufacturing, process control, remote monitoring, and data acquisition, let us show you the Opto 22 difference.